of the petals starts out cream colored or yellow, which turns into bright pink or velvet red on the top half. Inside the cup is a mass of white stamen about 1-2 inches long which all bend towards the center. The leaves look like flat spoons, or paddles, which grow alternately along the several stems of the plant. They are thick and stiff and round in appearance. Their petioles (leaf stems) are quite long, about 1-2 inches. Protea can take moisture in through its leaves. This works well where it grows. There isn't much annual precipitation. Ocean fogs frequently blanket the area of the coastal chaparral and plants have adapted to getting their water through their leaves. King protea are valued for their decorative qualities. They dry very well and are commonly used as focal pieces in flower arrangements. It is said that protea leaves are also used to make tea. Proteas live in a fragile environment. 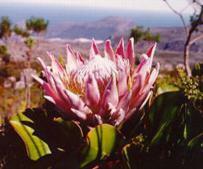 Of the 370 protea species, about 120 of them are listed as endangered. There are very few wild proteas anymore, most of them are now cultivated in greenhouses or nurseries.